I lit the Mini max and let it preheat to 350° before adding the roma tomatoes, red onion, jalapeno, and garlic. I did not oil the vegetables but placed them directly on the grilling surface. I let the vegetables roast directly over the lit charcoal turning them occasionally. It is worth noting I put the garlic on later as to not over cook it. How long this will take depends on how “charred” you want the vegetables. I kept them on for 15 minutes and they came out looking like this. After the roasted vegetables cooled I roughly chopped them and added them to a food processor with cilantro, lime juice, cumin, salt, and pepper. This salsa had that fire roasted flavor I like in my salsa. If you are familiar with Uncle Julio’s that is the flavor of salsa I was going for with this cook. Next time I am going to tinker with the heat level as I want more kick to the salsa. But this batch was a big step in the right direction! 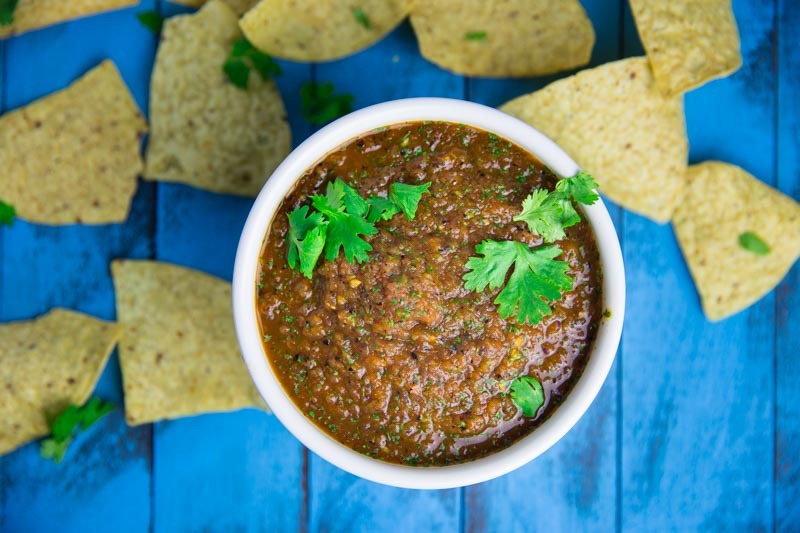 This recipe for Kamado Style Fire Roasted Salsa focuses on cooking the vegetables directly over the charcoal to get that authentic flavor. This looks good and easy. I’ll definitely have to try it. I have the BGE on my Christmas list, but your article about the rotisserie chicken opened my eyes to the Kamado Joe grills, and I must say I really like their story and brand. Before the BGE, I had a new Weber on my list. As far as the coking results and food flavor, how do the two types of grills compare (Standard gas grill vs ceramic Kamado-styles)? For me gas is about convenience and charcoal is about flavor. With ceramic grills you can do low and slow (traditional BBQ), high heat (pizza or searing steaks), and everything in between. There is never a right or wrong in my book but if you love cooking and eating a kamado style grill is the best bet! Got it. Everyone I know with a ceramic grill raves about them. I was planning on taking the wife to this year’s BGE Eggtoberfest in Atlanta to get a better idea of what they’re all about, but I have a scheduling conflict. Thanks for the info, and keep the goodness coming!